Tell the students that this is the final module in the program. Their goal is to try to pull together material they learned in earlier modules to draw some conclusions about drug use. Have the students watch the DVD. Stop the DVD at the break. Make sure that each student has all the Instruction Sheets, Fact Sheets, and notes from previous modules, as well as the scrapbooks from Module 1. Tell students that their challenge is to add a page to their scrapbooks from Module 1 to reflect what they have learned during the program. These pages will serve as a before and after summary and will assess their growth and understanding over time about the brain and drugs. Based on what they know now, how would they depict people drinking and smoking in ads? How would they describe drug use to friends? Give the students class time to modify their scrapbooks. They may choose to find new pictures to put in, or they may simply change what they say about the images. Finish watching the DVD. When the DVD is over, bring the class back together to share their scrapbooks. What conclusions did the students come to? 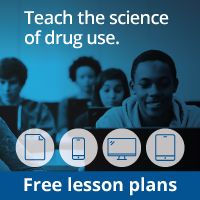 Did most students change their ideas about drugs and how they should be depicted in the media? One member from Group A should read the question to be answered by Group B. Group B should discuss among themselves before agreeing on an answer. Group B has two options at this point: (1) Group B members can agree on an answer that a group member will announce, or (2) they can ask for a clue from Group A. The point system is explained in the chart below. After all the questions have been asked to both groups, declare the group with the higher number of points the winner. Take the time now to emphasize how collaboration results in more points for both groups in this activity. Explain how scientists benefit from collaboration as well. When researchers work together, they make better progress. Discuss what addiction means. Ask whether that piece of information changes their opinions about drug use. Discuss what collaboration means. Ask whether scientists benefit more from competition or collaboration.